Norrena cyningas beginað hiera getǣl in 872 in sƿylcum geare hæfde Harold Fægrehar sige æt Hafrsfjord, hƿǣrof ƿæs he cyning ofer eallum Norþƿege – se ærrsta cyning mid sƿylcum miclum rīce. Haroldes fæder rīce ƿæs Ƿestfeald on Osloflēotes ƿesthealfe, ac Haroldes cynedōm ƿæs of þæm flēote oð þæm ƿestsǣ and oð Orcanege. Haroldes cynecynn, þæt Fægrehar Hūs, endode in his spearhealfe æfter Haroldes sunsunan dēaþ, se ƿæs Harold II, in 970, ac Norrena cyningas oð 1387 nam þæt ilce hūs naman. Ūtan ƿig ƿiþ Dēna cyningas in þæm 10. and 11. gearhundum ƿæs Norþƿeg sundorrīce oð þæm 14. gearhund. In 1387, Norþƿeg and Sƿēoland ƿrohtedon ānnesse mid Denemearce and Norþƿeges cynehelmes ierfe ƿæs Christian I Dēna Cyning in 1450. Æfter þissum cyningas þæs setlas ƿæron æt in Ceapmannahæfne ƿæron Norþƿeges cyningas oð 1814. Norþmenn sohtedon sundorrīcehād eft in 1814 and ceason Christian Friþerice, Dēna Æþeling to bēon cyning, ac Carl XIII Sƿēona Cyning onsƿōg þæt land forþæm þe hit ƿæs his riht be friþgeƿrite and he ƿeard Norrena cyning be naman Carl II. In 1905, beendod þās ānnese and Norþƿeg siððan 1905 hæfþ Norþƿeg his aga cyning, of þæm Dēnisc cynecynn in þæs Sillende-Holstān-Sonderburg-Glücksburg Hūs. In geardagum ƿæron Norrena cyningas be titul on Norðisc Konge til Norge Todæg secgþ man Norges Konge, se is "Norþƿeges Cyning". son of Sigurd Haakonsson, Eorl of Lade and Bergljot Toresdatter Þora Skagesdatter & others? 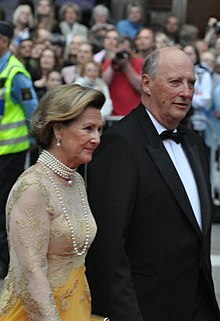 List of Norwegian kings (Norwegian). The Royal Court. Begieten on 2008-06-16. Carlyle, Thomas (1875). The Early Kings Norrena Cyning: Also an Essay on the Portraits of John Knox. Chapman and Hall. ISBN 978-1-4068-4287-6. Retrieved on 2008-06-15. ↑ Aschehougs Norgeshistorie, vol. 2, p. 92. ↑ Ānnes with Swēoland in 1814. The Royal Court. Begieten on 2008-06-17. Man nīwanost wende þisne tramet on þǣre 09:57 tīde þæs 21 Solmōnaþ 2019.